Runs true right out of the Package, and dives 8 to 12 feet on a long cast. Excellent trolling lure, can get to depths of up to 18 feet or more when long line trolling. These lures have a medium wobble, and flashy color patterns that attract Crappie, Bass and Walleye. Dimples on the body of the bait provide extra light refraction and flash in the water, as well as a better water displacement, coupled with internal rattle system helps all types of game fish to home in on these baits. Technical Specs: Pico INT crankbaits are Approx. 3/8oz. with a body length of 2 inches, a bill length of 1-1/2 inches for an overall length of 3-1/2 inches. Approx. Diving depths are as per chart. 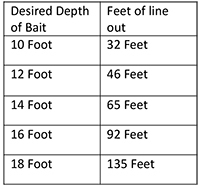 Use for a beginning reference only, as boat speed, line size, etc. all influence diving depths. Remember to mark your distance from where your line enters the water, not from the tip of your rod.